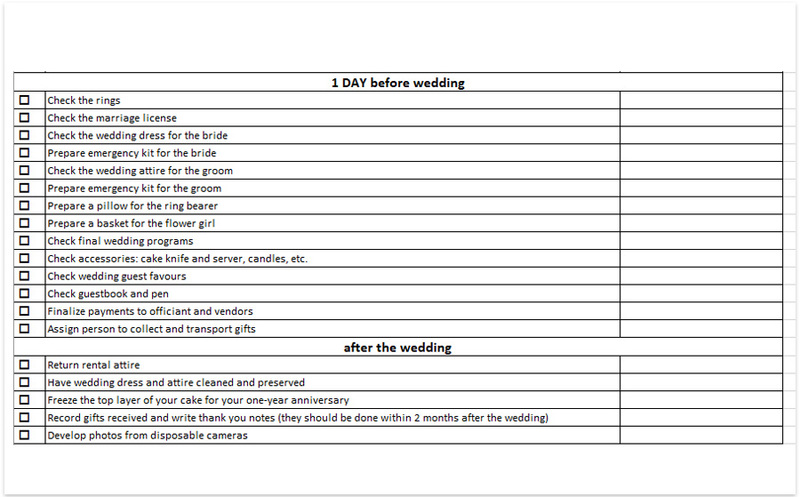 Wedding checklist excel is a document which has a huge demand by any person planning events, such as weddings. Wedding checklists excel help the planners to work on the wedding processes, to count number of tasks and mark the accomplishment of things to be done. We all know wedding planning can be stressful and complicated. The useful documents, such as wedding checklists excel can make this process easier for you. For example, a wedding checklist excel will help you not to forget important things and think about the tiniest details associated with your wedding. Using your wedding list excel, you can see what things need to be done, what tasks have already been accomplished and be sure that you stay on track with all your planning processes. Usually, the wedding checklists excel are created as a list of tasks to be done with the countdown until your wedding day. Some people usually make a common mistake ? they perfectly know what tasks need to be done, they create large to-do lists but end up having no idea where to start and don?t understand the sequence of procedures. The wedding checklist excel includes every step you should take from choosing your perfect wedding dress to ordering paper stationery for your wedding. All this is linked to a certain period when these activities should be done. Some people prefer starting to plan their wedding immediately after the engagement. The wedding day may be in 2 years or 3 months. Still, you will need to think about all the things to do and begin searching for the right location and vendors. Wedding experts state that the optimal time to start planning a wedding is 12-16 months ahead. So, you are engaged. Congratulations! The first thing to do now is to set your wedding date. A lot of activities and events of your wedding depend on the season, on the weather, on the location, type and size of your event. Think carefully about your wedding style and theme. There are lots of new trends in the wedding industry. Two years ago, rustic and eco-focused weddings were very popular, and the venues, such as farms, barns and ranches were overbooked. Boho and shabby chic weddings with interesting designs and d?cor were favourite as well. One of the most important things to pay attention to is your wedding budget, which is an important section of your wedding planning checklist excel. Are you going to plan your wedding with your own resources, or maybe you will benefit from contributions of your family and friends? If you have chosen your final wedding date and you know how many financial resources you have, start thinking about your guest list. Decide on the approximate number of guests, – this will help you to choose your wedding venue. 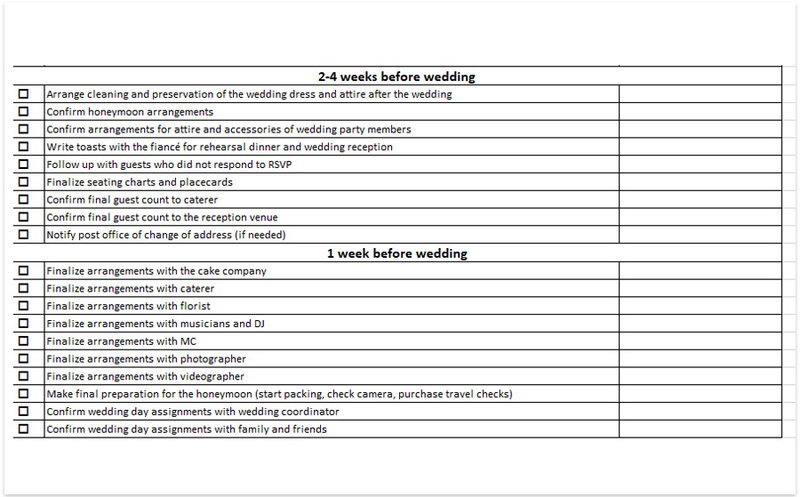 Use your wedding list excel to make the right final decision on the venue. To match your wedding style, theme and the number of guests with the right location, start thinking about your perfect venue. Discuss this issue with your partner, with your family and friends and with those who have already experienced the wedding planning process (for example, you can find lots of blogs and articles, comments and forums, where the ex-brides share their recent practices). Ask yourself: do you want to have your ceremony and reception at the same place? If not, you will need to add additional tasks to your wedding plan checklist excel to hire more vendors and negotiate the conditions with the venues. And, of course, have your engagement party ? tell the world, how happy you are! There are 12 months left before your big day. It?s a high time to act and make the right decisions. Make site visits to the selected venues, decide on the perfect ones for your ceremony and reception (if separate) and book it or them in advance. Now you can start choosing the right wedding vendors ? florists, caterers, photographers, videographers, stationery companies, transportation services, decorators, entertainers, DJs, officiant, hair and makeup artists, cake companies, sound and light professionals, etc. Think about the entertainment options for your guests: do you want to have a live band, a cover band, or maybe a string quartet or a pianist for your wedding? Depending on your budget, you can also think about outdoor aerial acts or magic shows to vow your guests. Don?t forget to add all the details to your wedding checklist excel to finally make the right decision. Catering is essential as well. Catering doesn?t only include your brunch, lunch or dinner at your wedding, but also snacks, finger food, refreshments, alcoholic and non-alcoholic drinks, coffee and tea for your cocktail hour, which usually takes place between the end of the ceremony and the wedding reception. Think about the dietary restrictions of your guests and special meals for the kids. Book your photographer and videographer. Discuss all the details and lists of shots. Some VIP wedding guests sometimes require special attention and the day of photographer?s work may start at 6 pm to capture all the getting ready processes of the bride and groom. Think about hiring decorators ? create a list (or use a board on Pinterest to show it to the professional) of all the d?cor elements you would like to have for your wedding. If your venue doesn?t offer supplies, such as chair covers, tableware and silverware you need, contact a d?cor company to rent all the necessary things for your wedding. Collect all your ideas and put them down in your wedding checklist excel in order not to forget anything. Create a clear vision of the bridal bouquet, table centrepieces, ceremony arch decoration and boutonnieres for the groom and the groomsmen. Discuss your ideas with the floral designer and book your florist. Think about your wedding dress. Research on the Internet and local stores, consider options and see how perfectly it will match with groom?s attire. As soon as you have found a perfect one, don?t forget to have several fitting visits with your dress company or store. Think about the design of your stationery ? save the date cards, RSVPs, invitations, place cards, signage, etc. Find a company and start discussing your ideas. Having 8-10 months before your wedding, book your music entertainment ? the music for the reception and music for the ceremony if needed. Meet a DJ and discuss a playlist. The good idea is to ask your guests about their music preferences to make them dance all night long. Order your wedding cake, book your honeymoon, think about the accommodation for your out of town guests and ask about the airport transfers for your invitees, if needed. Start planning your hen and stag parties. 4-6 months before the wedding, the bridesmaids order or purchase their wedding dresses, the stationery is orders, the suit for the groom is almost ready (orders or purchased as well). Contact you transportation companies to organise wedding transport. Discuss your wedding ceremony preferences with the officiant. 2-3 months before your wedding, send invitations to your guests, order wedding rings, think about the gifts and favours for your guests and have your makeup and hair trials. 4 weeks before your wedding, your wedding dress should fit perfectly; all your vendors need to know what to do for your wedding day. One week before your wedding you will definitely know the final number of your guests. Create your table plan, think about the supplies for your vendors (for example, separate rooms for the entertainers or a table for a DJ), print place cards, confirm arrangements and create a timeline for your wedding day. Organize some cash to be paid for the vendors and suppliers, have all your wedding attire ready and make sure everything fits perfectly ? from the underwear to the shoes. 2-3 days before the wedding have your beauty treatments, discuss final details with the vendors and coordinator. Think about last-minute substitutions and last-minute emergencies. At the day before the wedding, make sure everything is done: the place cards, gifts and favours are ready, create a list of all the important contacts, check the delivery time of the cake, rehearse the ceremony and? relax before your big day! Considering the fact that every wedding is unique, you can create your own wedding plan checklist excel to monitor all your planning activities. There are lots of tasks to think about while planning your wedding. We all know that planning can be stressful and take much time. Luckily, there is an online tool eazyplan, which can make your planning easier. It provides dozens of useful templates and checklists, which you can use for planning. Using eazyplan, you can download your wedding planning checklist excel, make changes, add tasks and enjoy your planning.